the "Prelude" (before Chapter 1), two "Interludes" (after Chapters 3 and 6), and "Postlude" (after Chapter 9) contain new songs and follow-up activities. The accompanying video program, featured on the new Premium Website, adds a visual component. 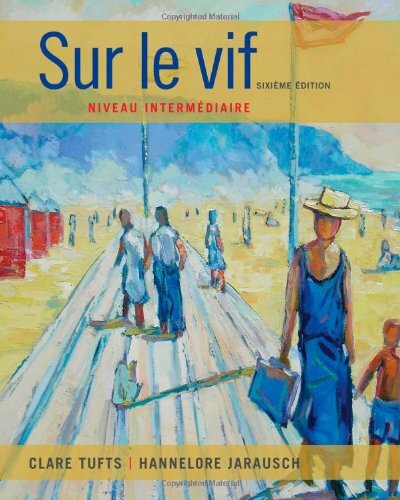 By skillfully weaving grammar review into thought-provoking chapter themes, SUR LE VIF provides a solid review of first-year French while adding refinements for improved skills in reading, listening, composition, and conversation. Clare Tufts is a professor at Duke University where she directs the French language program. She publishes in the areas of French and Francophone theater and culture. She teaches courses at all levels in language, culture, and literature. Hannelore Jarausch is a professor of French at UNC-Chapel Hill, where she directs the French language program. She teaches courses in methodology, language, and literature, and has authored an advanced intermediate text.